Cinnamon is more than a fragrant, warming spice used in oatmeal, cookies, and cakes. Made into a spicy, fragrant tea, cinnamon benefits your health in a variety of ways – arthritis, blood sugar, viruses, yeast infections, and more. Cinnamon comes from the bark of a tree native to Southern Asia. It is often found in tea blends, but is just as nourishing and beneficial drank on its own. Cinnamon bark contains eugenol, a natural antiseptic that fights bacteria (such as e. coli), combats fungi (including Candida albicans, which is a common cause of vaginal yeast infections), and targets viruses (such as cold and flu viruses). Traditional Chinese medicine frequently uses cinnamon to combat colds and flu, often prescribing it at the onset. As a tea, cinnamon’s warming benefits bring welcome heat to cold hands and feet. And there’s nothing like a nice, warm cup of cinnamon tea on a cold winter night when you feel chilled all over. Cinnamon tea’s reputation in the fight for weight loss is growing. It is rich in polyphenols which stabilize your blood sugar, leaving you with fewer cravings and hunger pangs. It also contains antioxidants that may help boost your metabolism, while soothing your digestive tract and warding off any unseemly gas and flatulence, leaving your stomach flatter. The health benefits of cinnamon include pain relief. Whether you’re suffering from a throbbing headache or your muscles are sore after a workout, cinnamon may help you find relief. Cinnamon is well-known for its anti-inflammatory properties. Chronic inflammation has been linked to many health issues, including heart disease, PCOS, IBS, infertility, arthritis, rheumatism, and Parkinson’s. 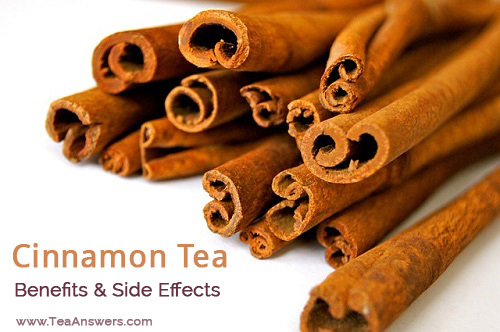 A soothing cup of cinnamon tea is a tasty way to protect yourself from the potentially harmful effects of inflammation. Cinnamon bark and powder are generally considered safe. However, concentrated cinnamon oil is toxic and can cause nausea, vomiting, and kidney damage. If you drink large quantities of cinnamon tea, you may experience diarrhea as an unpleasant side effect. Before you add this tea to your diet, you should speak to your healthcare provider to be sure cinnamon tea is safe for you.